HOME > SCHEDULE > Hiroshi Fuji Solo Exhibition - Central Kaeru Station - Where have all these toys come from? Hiroshi Fuji Solo Exhibition - Central Kaeru Station - Where have all these toys come from? Over 30 years the artist Hiroshi Fuji, without being swayed by the currents of fashion, has kept his eye intently upon society, community and the everyday, coming to tackle big statements such as "Turning towards a Recycling Society" and "Transforming Local Communities". Since the invention of the toy exchange system "Kaekko" in 2000 over 5000 events have taken place over 1000 different sites across Japan and internationally, while also responding to local issues and leading to the development of citizen led community based projects. 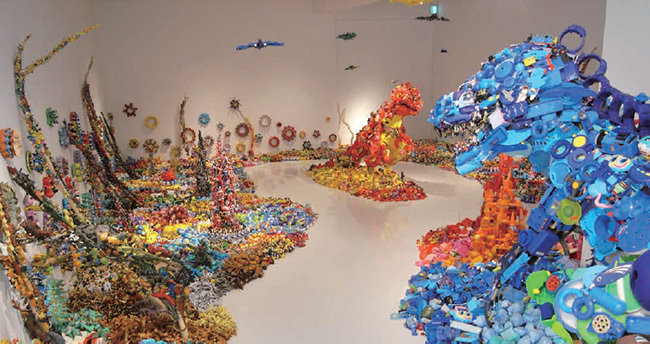 This exhibition taking "kaeru" as its theme (meaning to change, to return, to exchange, to be able purchase) brings together over 50,000 toys gathered together over 13 years of "Kaekko", along with various installations and workshops. Furthermore with a mountain of materials such as plastic and wire which Fuji has amassed through his everyday life and various projects, there will also be a range of works made from these recycled goods, along with an introduction to the chain of regional activities Fuji has fostered, as well as a silent auction where you may have the chance to bid for selected works. From children to senior citizens this is an exhibition to be enjoyed by all, with plenty to see, think, discover and experience, a perfect summer holiday outing. Hiroshi Fuji Exhibition - Central Kaeru Station - Where have all these toys come from? Born in 1960, Kagoshima prefecture. After devoting himself to drama performance during his studies at Kyoto City University of Arts, he inclined towards creative expression which takes local community as its stage and went on to found the Kyoto Intelligence Company. After joining various programs in urban Kyoto and along Kamogawa in "Kyoto Art Network" he came to move across the country, realizing projects in numerous regions engaging in dialogue and community experiments. After graduating from the master course of the same university he joined JICA Japan International Cooperation Association and began to work as a lecturer at Papua New Guinea's National Art School. 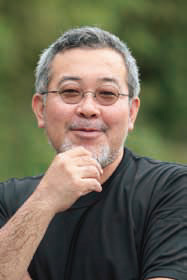 Then after joining an urban planning group he established in 1992 the Fuji Hiroshi Design and Production Room. Ever since he has been in pursuit of numerous engagements and while paying note to community resources, appropriate technology, cooperative relations he has developed an art form which promotes a chain of activities. Since 2012 he has become the vice-director of Towada Art Center. Major exhibitions include 2010 "Setouchi International Art Festival" (Kagawa), 2008 "SITE Santa Fe Biennale" (SITE Santa Fe, USA), 2006 "12th Bangladesh Biennale" (Osmania Memorial Hall, Dacca, Bangladesh), 2005 Solo Exhibition "Arts over Doubts!" (Fukuoka Art Museum, Fukuoka).